The Frankie is new for 2017 and offers a very smart white foil finish on mdf board Cabin bed that offers great value, as mdf is often used in children’s beds as it is often stronger than pine. 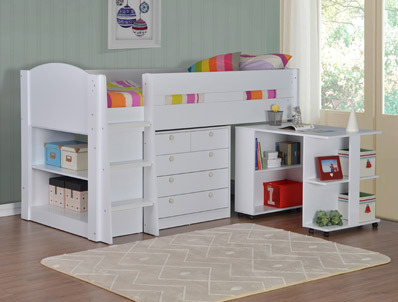 The Frankie cabin bed offers a pull out desk with bookcases attached and a 4 drawer wide chest of drawers in the front face of cabin bed with a 2 shelf bookcase in the end of the bed frame. The bed is supplied flat packed in 4 boxes for home self-assembly in 5-7 working days and is made to UK standards. It takes a single size 90cm x 190cm size mattress not included. 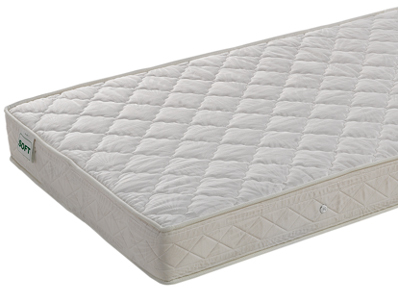 Because of the depth of the bed frame we would recommend a 15 -18 cm deep mattress. So we have added a couple of mattress options to the frame, like the Relaxsan Moon mattress which is available in soft or firm, and is 16cm deep.